Ever since it arrived in the mail a few weeks ago, I've been completely absorbed by my copy of Niloufer Ichaporia King's "My Bombay Kitchen", which is probably one of the best cookbooks that I have read in a while. Niloufer weaves a rich tapestry of story and food to describe one of the most unique and ancient cultures in the world. She walks you through the origins of the Zoroastrian people in Persia and their subsequent migration to the shores of India where they established themselves into the well-respected Parsi community. The book is complete with photographs of her childhood and family along with descriptions of some of the customs and cultural elements. Of course, beyond the amazing collection of recipes, she talks about food and its importance among the Parsi. 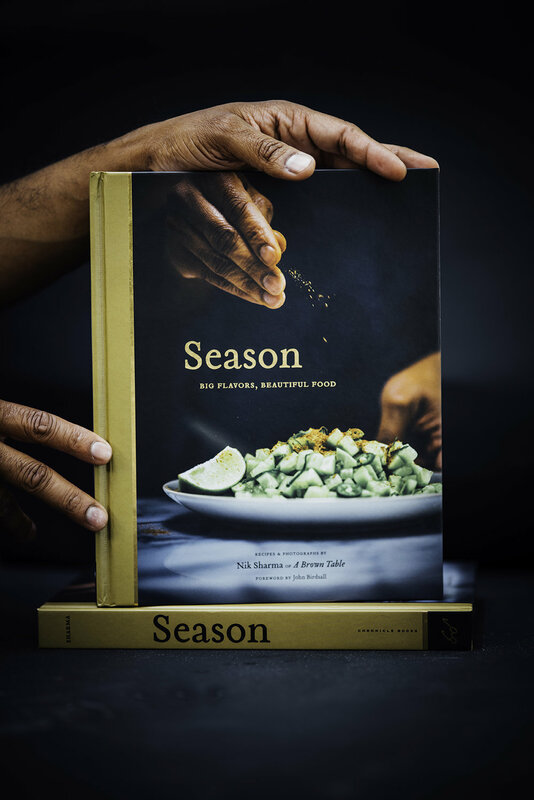 This book is more than just a cookbook, it is a fascinating account of people, history, culture, and food and it should come as no surprise that this book received the coveted James Beard award in 2008. 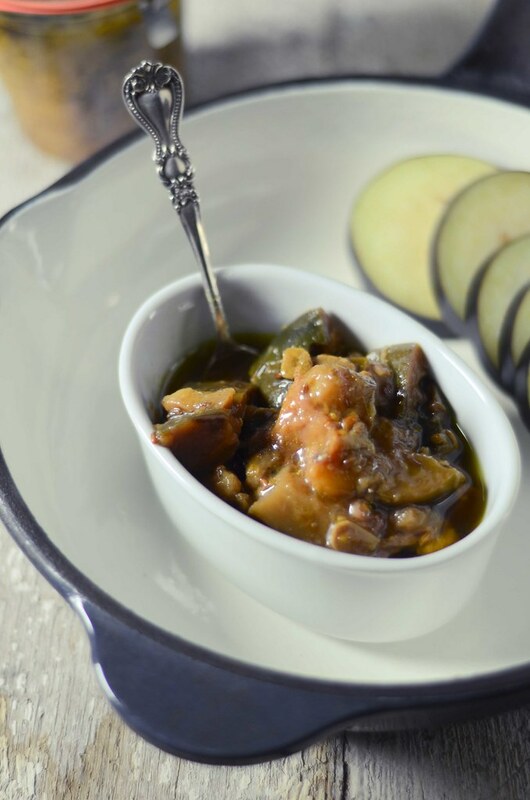 As soon as I came across Niloufer's Parsi eggplant pickle recipe, I felt a strong desire to indulge a little. You see, eggplants are probably one of my favorite vegetables and it was hard to pass up an opportunity like this. This pickle recipe has a bit of everything in it, it is deliciously hot, sweet, sour, and salty. It hits all of the taste buds in the mouth and all the notes of your culinary senses. Pickles are a staple in most Indian meals with a little bit served as an accompaniment to each meal. They can revamp a simple or boring meal into something much more exciting which is exactly what this eggplant pickle does. Breathing in the delicious aromas from the cumin, fenugreek, and fennel seeds while they sputtered in the hot oils, was heavenly. 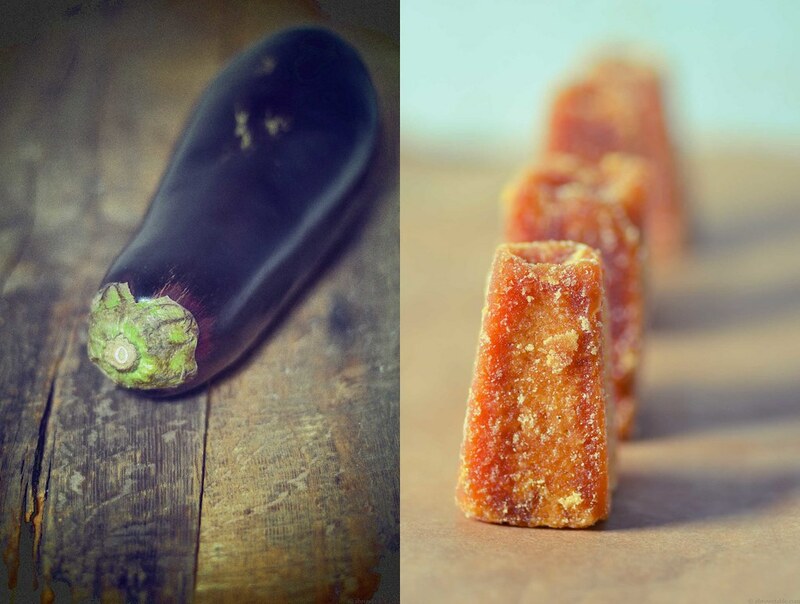 The flavors get even more bolder once the vinegar and jaggery cook with the eggplant cubes over the stove. 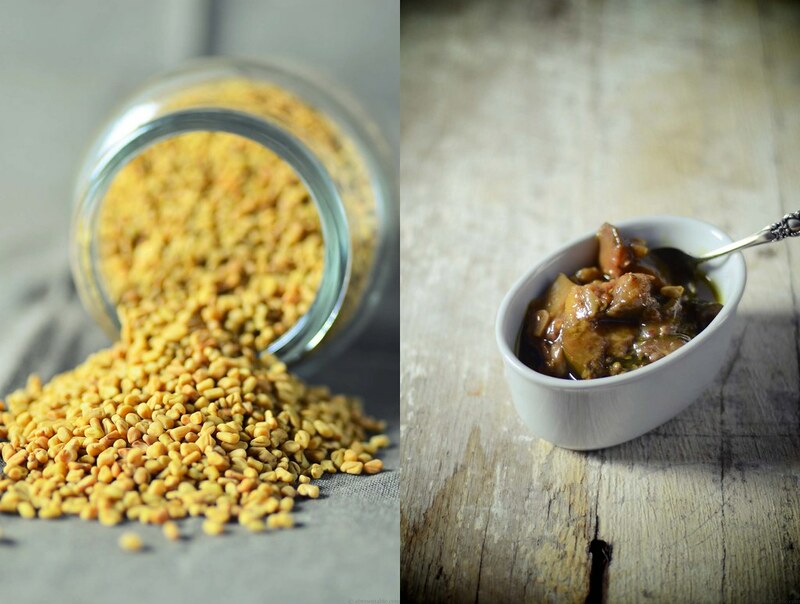 Jaggery is a type of raw sugar that can be found at most Indian grocery stores but a lighter variety of brown sugar would do equally well in this pickle. For this particular recipe use fresh eggplants that are not bitter such as the Thai varieties to get a great tasting pickle. I prefer to buy my eggplants on the day I plan to cook them otherwise they get brown and bruised (They ripen very fast once plucked from the plant and will brown even in the refrigerator). 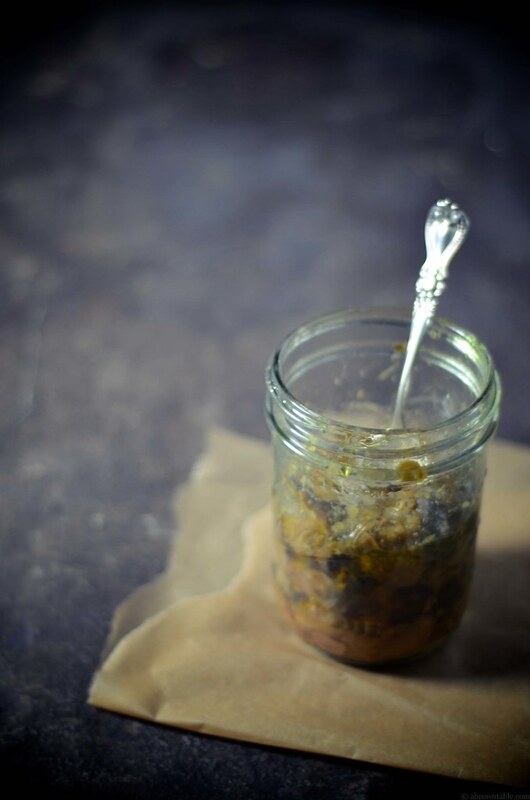 Since I made a batch of this pickle, we have eaten it daily with almost every meal possible which makes me worry that maybe I should have made a larger batch! 1. Heat the oil in a large non-reactive pan or deep pot on a medium-high flame. When the oil is hot add the fenugreek, cumin, and fennel seeds. The seeds will begin to sputter, immediately reduce the heat to a medium-low flame to prevent the seeds from burning. 2. Immediately add the garlic and ginger to the oil. Stir till they turn golden in the hot oil. 3. Add the Kashmiri chili and turmeric powders and cook for 15 seconds. 4. Add the eggplant and halved chili peppers to the hot oil and spices. 5. Stir in the vinegar and sugar. Stir the contents of the pot carefully, reduce the heat to a simmer and cover the contents with a lid. Cook the pickle for one hour with occasional stirring. If the eggplant begins to stick to the bottom of the pot, then add more vinegar (but never add water). 6. Season the pickle with the salt and adjust the balance of the sweet and sour by adding more jaggery (sugar) and/or vinegar. 7. Transfer the cooled pickle into clean and sterile canning jars. Make sure there is a little bit of oil floating on the surface of the pickle in each jar. Seal the jars and process for 20 minutes (canning time can vary depending on your altitude). In "Canning", "Eggplant", "Indian", "Parsi", "Pickle"